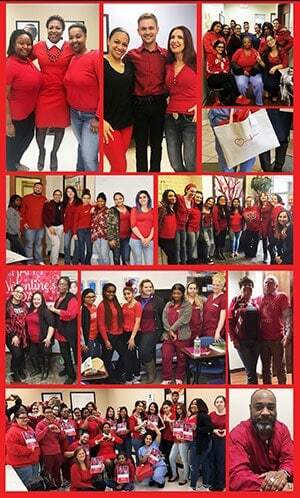 February 16, 2018, All Locations – American Institute students, faculty, and staff brought focus to women’s heart health again in 2018 as they joined the National Wear Red Day and Go Red for Women movement by wearing their red and focusing on educating those within their circle of influence about heart disease in women. The American Heart Association’s annual Go Red For Women campaign originated in 2004 as they faced a challenge in both awareness and understanding of heart disease among women and their healthcare providers. Historically, heart disease had been associated with older men primarily and there was a lack of understanding about how the disease presented in women that was causing preventable deaths. American Institute is proud to be part of the education and community awareness efforts to help women ‘know their numbers’ and proactively manage their heart health for longer and healthier lives. With the assistance of Jenifer Morack, Director of Garden State Go Red For Women, the Somerset, NJ campus was privileged to host a seminar on campus from two women who shared their passion for this cause, namely Laura Vetter, RDN, CDE, CSO, CSP, an Outpatient Nutritionist at St. Peter’s University Hospital, and Pamela Coleman, an American Heart Association Go Red For Women Survivor Ambassador. Ms. Coleman was born with congenital valve disease that required several surgeries over her lifetime and affected her pregnancies, resulting in additional emergency procedures to correct. She is focused on educating the public on women’s risks for heart disease and how they can both protect themselves and how to address issues should they have some type of heart disease. Ms. Vetter provided insight into healthy eating and nutritional facts to help heart and overall health. Her presentation focused on types of food, the impact they make on heart health and the preparation of meals as important to healthy living. American Institute was also proud to contribute $250 in donations from students and staff to support research and education to reduce and treat heart disease in women..